Convenient toilet and shower rooms are designed to add a touch of elegance to the camping experience. You may be surprised at how nice our shower rooms and toilets are. Ladies and gentlemen’s rooms each feature four showers with private dressing areas. 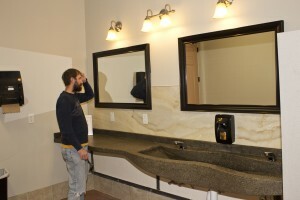 Custom made sinks with dramatic lighting and mirrors are available for personal hygiene. The rooms are located in the middle of the main building with access from each end, convenient for tent campers and residents in the cabin-style rooms.